Since 1983, the brothers Fernando (born 1961) and Humberto (born 1953) Campana have been solidlu building their career, achiebing both national and international recognition. Their work incorporates the idea of transformation and reinbention. Giving preciousness to poor, day-to-day or common materials carries not only the creativity in their design but also very Brazilian characteristics- the colors, the mixtures, the creative chaos, the triumph of simple solutions. Based in Sao Paulo, Estudio Campana is constantly investigating new possibilities in furniture making. It creates brides and dialogues where the exchange of information is also a source of inspiration. Working in partnership with communities, factories and industries keeps the Estudio Campana repertoire fresh. Campana pieces are included in the permanent collections of the Museum of Modern Art, New York; the Centre Georges Pompidou, Paris; Musée Les Arts Décoratifs, Paris; the Vitra Design Museum, Weil am Rhein and the Museum of Modern Art, Sao Paulo. 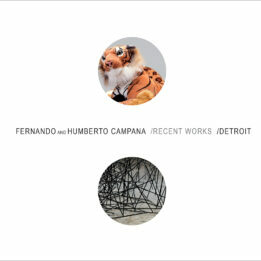 The Campana Brothers’ works were first shown in Detroit, Michigan, in the spring of 2014 in an exhibition titled Fernando and Humberto Campana/Recent Works.